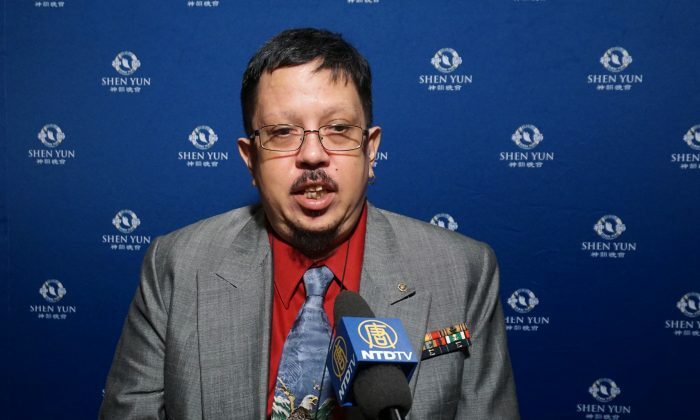 CHARLESTON, W. Va.—United States Navy veteran and retired chef Tony Mar confessed to being completely bowled over by Shen Yun Performing Arts as he sat in the front row in the Clay Center for the Arts & Sciences with his mouth open on the evening of March 30. “This, to me, is one of the most moving, incredible experiences of my life, because this connected me with my culture. And I thank these kids from the bottom of my heart for this,” said Mr. Mar who explained that although he was born in the United States he is partially Chinese and felt that he had regained a part of his culture. “The amount of discipline, and passion that they put into this, you could feel it coming off the stage,” said Mr. Mar. During the performance, he got emotional a couple of times, one instance being when he saw the story-based dance “Monkey King and Dragon Palace,” inspired by the classic novel “Journey to the West.” Mr. Mar said that it was his favorite childhood story, told to him by his father and then later again when he read the books himself. He also mentioned that he liked the dance “Poets of the Orchid Pavilion” in which a group of scholars in ancient China play a unique drinking game by the banks of a stream. They send wine cups floating down its currents and whenever a cup stops in front of someone, he has to empty it and compose a poem. Through the game, they created a famous anthology of 37 poems. “I was really impressed with the discipline, the spirituality, the passion that these dancers have. It amazes me because these traditions, the dance that they’re bringing back, the culture that they’re bringing back, is something that can never die, because these people are doing it,” said Mr. Mar, noting that he is aware communism has destroyed the traditional culture in China. “You don’t get to have a culture. You get to have what the Party tells you or nothing else,” said Mr. Mar. “Five thousand years of history. It was incredible. That’s a lot of history to try to bury. But like I said earlier, it will come back. These kids, they will pass it on,” he said referring to the young dancers. Mr. Mar has spent his whole life in America, but he always wondered what it was like to go to mainland China. When he was in the Navy he had made it as far as Hong Kong but as an American serviceman going into communist China was not something that was going to happen. Yet the longing to re-connect has always persisted, and watching Shen Yun rekindled the flame for Mr. Mar. He reflected on the fact that “in a world where technology has taken us to a point where we are disconnected, this is something that reconnects people, and reconnects cultures, and makes people go, ‘wow’, there’s something more than my iPad, there’s something more than my email—there’s a whole 5,000 years of history out there that you need to know. You have to understand it. Because you can’t grow unless you do,” said Mr. Mar with passion and gratitude in his voice. He said that he would go home “maybe more fulfilled—spiritually and culturally” with a new perspective. Something that his father had instilled in Mr. Mar through teaching him to play chess was that no matter how confusing the chess board can get, one needs to step to the right and look at the game from a different perspective. “You get a whole new understanding of what’s going on. The same with this. I took that step to the right, by coming here, and I learned something entirely new. From the stuff that I already heard, but from a different perspective. It was incredible,” said Mr. Mar.